State highway professionals are gathering at eight regional summits this fall to learn about the second round of innovations under Every Day Counts, the Federal Highway Administration initiative to shorten project delivery. After attending sessions on innovative project delivery strategies, they’re meeting in state caucuses to consider which to apply in their own states over the next two years. "We’re holding these summits for the people who are on the front lines of project delivery, the people who make the day-to-day decisions that all add up to completed projects," FHWA Administrator Victor Mendez said at the Baltimore, Md., summit. Others are being held in California, Georgia, Michigan, Missouri, Oregon, Rhode Island and Texas. The summits are designed to give participants the opportunity to explore Every Day Counts strategies in detail so they and their state agency colleagues can make informed choices about which to implement. FHWA has formed teams of experts to help highway agencies deploy the Every Day Counts innovations they decide to pursue. "Every Day Counts is not about inventing the next big thing. It’s about taking effective, proven and market-ready technologies and getting them into widespread use," FHWA Deputy Administrator Gregory Nadeau told Baltimore summit participants. "By advancing 21st century solutions, we can improve safety, reduce congestion and keep America moving and competitive." FHWA launched Every Day Counts in 2010 to deploy innovations that shorten project delivery, enhance roadway safety and improve environmental sustainability. Every state has applied one or more of the 16 first-round initiatives, and many are now widely used. The second round includes 13 initiatives, several continued from the first round. For more on the summits, see future Innovator issues. For details on the initiatives, go to www.fhwa.dot.gov/innovation/everydaycounts/edc-2.cfm. To view a summit video, visit www.youtube.com/watch?v=JCBk6XE95jY&feature=youtu.be. The Puerto Rico Highway and Transportation Authority has been putting Every Day Counts innovations into practice at a lively pace, participating in nine of the initiatives aimed at shortening project delivery, enhancing roadway safety and protecting the environment. The Safety Edge, paved at a 30-degree angle to lessen roadway-departure crashes, is one of the Every Day Counts technologies used in Puerto Rico. Since the Federal Highway Administration launched Every Day Counts in 2010, every state transportation agency has applied one or more of the technologies and processes. In Puerto Rico, PRHTA has been working with FHWA to implement the Safety EdgeSM, adaptive signal control technology, warm-mix asphalt, programmatic agreements, geosynthetic reinforced soil integrated bridge system technology, flexibilities in right-of-way, flexibilities in utility relocation and design-build contracting. PRHTA has been building bridges with prefabricated bridge elements and systems since the early 1990s. And in the U.S. Virgin Islands, which FHWA’s Puerto Rico Division serves, officials have pushed ahead with three Every Day Counts initiatives: WMA, the Safety Edge and flexibilities in right-of-way. The Safety Edge is a cost-effective technique that angles the edge slope of new pavements to 30 degrees to mitigate roadway-departure crashes. 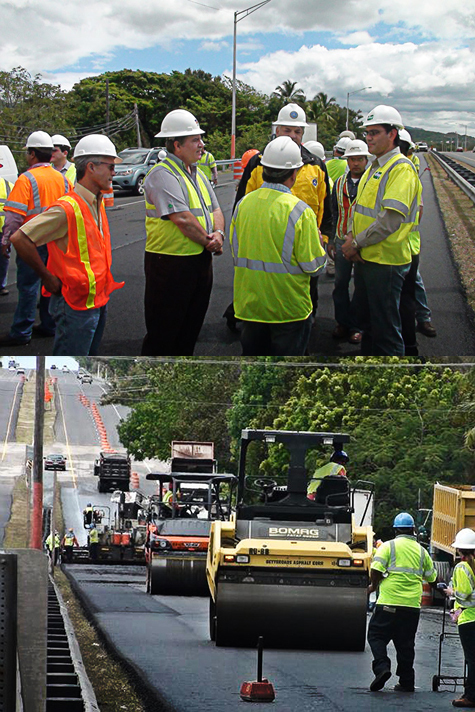 In summer 2011, the Puerto Rico Transportation Technology Transfer Center, part of the Local Technical Assistance Program network, participated in FHWA’s Safety Edge Loan program. The Colorado LTAP loaned one Safety Edge device, the TransTech Shoulder Wedge Maker, to Puerto Rico and FHWA’s Puerto Rico Division provided a Ramp Champ model from Advant-Edge. "We trained the trainers for two of the biggest asphalt producers on the island, Betteroads Asphalt Corporation and Robles Asphalt," said Dr. Benjamin Colucci, director of the Puerto Rico Transportation Technology Transfer Center and Every Day Counts technical oversight director. In another training exercise, the two companies used Safety Edge-equipped pavers to lay down two 100-foot (30.4-meter) strips of saturated sand to test the edge slope angle on the sand. Moreover, exchange student Leilany Benejam came to Puerto Rico from Purdue University and developed a manual on how to train people on both Safety Edge devices. A full-scale Safety Edge paving project was implemented in 2011 on Queen Mary Highway in St. Croix in the U.S. Virgin Islands. Last year, PRHTA contracted with Betteroads Asphalt Corp. to pave 23,500 tons of WMA in Yauco. WMA is paved at 270 to 280 degrees Fahrenheit, compared to conventional hot-mix asphalt at 300 to 325 degrees. WMA requires less fuel consumption and compaction effort and emits fewer fumes. Freddie Salado, a transportation engineering graduate student, is working on a laboratory research project to evaluate the engineering properties and cost-effectiveness of four WMA additives: Rediset, Evotherm M1, Sasobit and Kaoamin 14. The research is being done at lab facilities of Robles Asphalt, PRHTA and the University of Puerto Rico. "The Puerto Rico LTAP was hired to provide training and technical assistance," said Colucci. "The LTAP acts like a liaison with the private sector to make it happen. That’s our goal." Professionals from the public and private sectors collaborate on using innovative technologies such as warm-mix asphalt. Inset: The Puerto Rico Highway and Transportation Authority is using warm-mix asphalt to cut fuel consumption and fumes on paving projects. Credit: Puerto Rico Transportation Technology Transfer Center. November/December 2012. 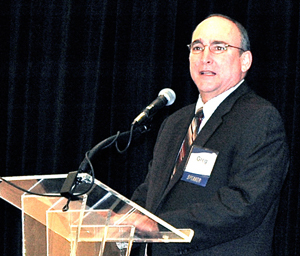 Colucci said PRHTA is a pioneer in the use of prefabricated bridge elements and systems to achieve time, cost and safety advantages on projects. In the early 1990s, Las Piedras Construction, a PRHTA contractor, erected a bridge over one weekend on PR-26, an expressway with an average daily traffic count of about 110,000 vehicles that connects San Juan with Luis Munoz Marin International Airport. PRHTA is working with FHWA to implement adaptive signal control technology on PR-2, a primary route through Mayaguez. The corridor, which carries about 80,000 vehicles a day, passes by seven commercial centers, a medical center and three universities, including the University of Puerto Rico. ASCT installations are being evaluated in San Juan in two locations. ASCT, which regulates traffic flow by using cameras and detectors that provide real-time information for traffic signals, will help reduce congestion and delays on PR-2, Colucci said. Puerto Rico also has been active in forming programmatic agreements, which save time on projects by establishing streamlined approaches for handling routine environmental requirements. "Since last January we have had new programmatic agreements between the PRHTA and agencies that include the Puerto Rico Cultural Institute, the Management Permit Office, the Environmental Quality Board, the Department of Natural and Environmental Resources and the State Historic Preservation Office," said Colucci. An example is a programmatic agreement signed July 31, 2012, involving the Puerto Rico State Historic Preservation Office, Advisory Council on Historic Preservation, PRHTA and FHWA. It established a streamlined process for PRHTA handling of routine actions with little or no potential to affect historic properties. It covers sidewalks, roadside barriers, resurfacing, pavement markings, traffic signals, lighting, bridge preservation and operational projects. The Utah Department of Transportation will use geosyn- thetic reinforced soil integrated bridge system technology when it builds twin bridges to carry Interstate 84 over a county road in the Salt Lake City metro area. GRS-IBS, one of the Federal Highway Administration’s Every Day Counts technologies, is expected to lower costs, cut construction time, improve durability and increase safety on the project compared to traditional construction. 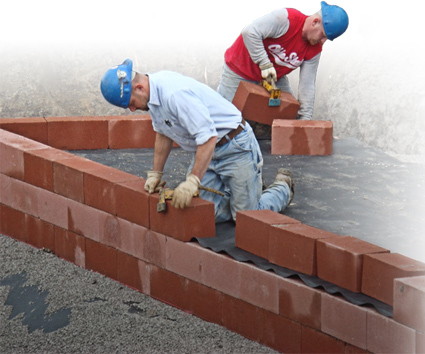 Rather than use cast-in-place concrete, GRS-IBS bridge abutments are built using multiple layers of geosynthetic-reinforced soil. One engineer likens it to building a layer cake. First, crews lay a row of facing concrete blocks. Second, they add an 8-inch (203-millimeter) layer of select backfill behind the blocks and compact it. Next, they place a geosynthetic fabric over the entire filled surface. They repeat the process until the desired height is reached. The Utah agency received a grant from FHWA’s Highways for LIFE program to use innovation on the $5 million project. The twin I-84 bridges have single 50-foot-long (15-meter-long) clear spans about 50 feet wide each. The geometry of the site permits each of the two GRS abutments to stretch across the median under all four lanes of the interstate highway. That way, both bridges are carried on the same abutments. The advantage of the 8-inch layers is that they make the abutment that much more solid, said Joshua Sletten, Utah DOT structures design manager. "The benefit for us is that it integrates the roadway approaches with the bridge," he said. "The whole structure is connected to the same foundation, which is this GRS mass. Because of that, we expect any downward settlement of the bridge to occur also with the roadway approaches. That should make for lower maintenance and a smoother bridge ride down the road. The Utah DOT will use time- and money-saving GRS-IBS technology to build twin bridges over I-84. "Our expectation is that each GRS abutment will be built in a week or two," said Sletten. "If you contrast that with conventional reinforced concrete abutments, where you excavate, form, pour concrete and cure concrete, that could easily be four weeks per abutment." To use the GRS-IBS method, you need a solid soil subbase, Sletten said, so this method can replace spread footings. But it’s not really fair to compare GRS abutments with deep pile foundations, he said, because you probably would not use the GRS method if weaker soil conditions require deep piles. "One of the nice things about GRS is that we can take the abutment all the way across the median in lieu of using two tall abutments," said Sletten. The first step in construction will be to build the GRS wall in the median and place a temporary bridge in the median. Next, the Utah DOT will divert traffic in one direction onto the temporary median bridge. Then the contractor will tear down one of the old bridges and erect the GRS wall and new superstructure in its place. Motorists will experience no impact other than a lane shift. Once the new bridge is built, traffic can resume on it. The site geometry affords the opportunity to use the same median bridge to take the traffic in the other direction. “We’ll demolish the second old bridge, prepare the roadway and build the second GRS, all with traffic still on that median bridge," said Sletten. "Then, with a single closure, we’ll close traffic down in the second direction and slide that median superstructure over onto the GRS abutments. As soon as that is slid over and tidied up, we’ll put the traffic back onto the new bridge. The abutment will extend across the median to accommodate future widening and serve as a retaining wall in the meantime." The superstructure for the I-84 bridges will consist of voided, prestressed, precast box beams. It will take 11 beams for one bridge and 13 for the other one, Sletten said. Using a technique called fault-tree analysis can help designers spot potential problems that could result in a bridge failure before it actually occurs. A Federal Highway Administration Web conference explained how to use the technique to design safer, more resilient bridges. "Resilient bridge design assures bridges will rebound quickly from extreme events," such as floods, earthquakes, high winds and heavy vehicle collisions, said Myint Lwin, director of FHWA’s Office of Bridge Technology, who moderated the Web conference. 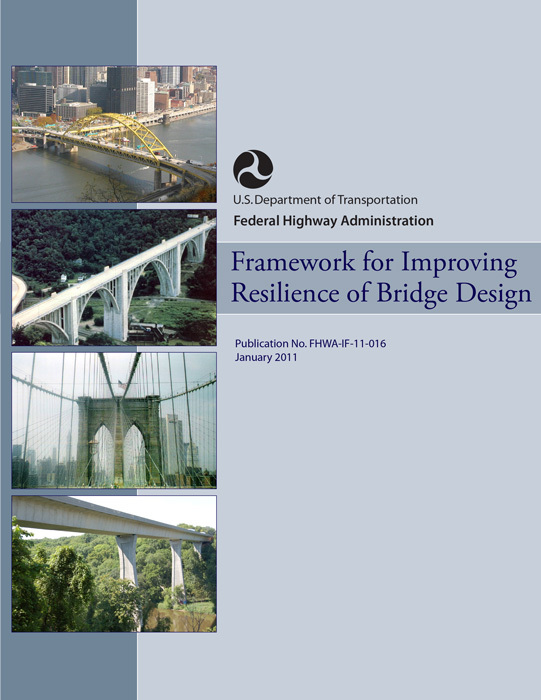 The Webinar, part of the free “Innovation” series sponsored by Highways for LIFE and the National Highway Institute, was based on Framework for Improving Resilience of Bridge Design (FHWA-IF-11-016), a publication available at www.fhwa.dot.gov/bridge/pubs/hif11016/hif11016.pdf. The report draws on lessons learned from past bridge failures that resulted in collapse, service closures or major repairs. By performing a failure analysis while a bridge is in the design stage, a designer can identify contributing factors or events that could lead to future failure and address them before they cause problems, Lwin said. Although no national database of bridge failures exists, a national study of more than 500 bridges showed that the leading cause of failure is external events, including floods and scour, or the washing away of sediment; collisions from heavy trucks, trains and barges; and deterioration from environmental effects such as corrosion. Construction-related deficiencies and lack of maintenance are also high on the list. A look at a New York State Department of Transportation database shows that the top three causes of bridge failures in that state are hydraulics (floods and scour), collisions and overloads. Framework for Improving Resilience of Bridge Design provides a checklist of issues to consider during the design process to minimize potential failures during the construction and service life of a bridge, said Dr. Brandon Chavel, senior engineer for HDR Engineering, who developed the document. "The ultimate goal of the framework is to design and build resilient bridges," he said. The framework includes fault trees, or graphic models that show potential failure paths, for both the superstructures and substructures of steel girder and precast concrete girder bridges that designers can use in their analysis. "Fault-tree analysis is often used in the nuclear energy and aerospace industries to show how a progression of events can lead to failure," said Chavel. During the Webinar, Chavel demonstrated how a fault-tree diagram can be used as a starting point for designing a bridge for safety, reliability, efficiency and sustainability. The diagram was developed in a top-down direction, with bridge failure as the top event. Intermediate events include categories such as operation, construction and inspection. Lower down are basic events that can cause problems, such as corrosion, overload, vehicle collision or storm surge. On a steel girder bridge, for example, a factor that could cause corrosion of girders and eventual bridge failure is inadequate drainage, something that could be addressed by eliminating expansion joints in the design whenever feasible. The fault tree enables the designer to see various failure combinations and failure paths and determine if additional analysis or study is warranted, Chavel said. "The fault trees are easier to follow than text in a document on potential failures and lessons learned. The diagrams help to prevent critical items from getting lost in the shuffle." To view past "Innovation" Webinars and register for future sessions, go to www.fhwa.dot.gov/hfl/resources. To access FHWA’s bridge preservation toolbox, visit www.fhwa.dot.gov/bridge/preservation. Stop by the Center for Accelerating Innovation booths at the Transportation Research Board Annual Meeting, January 13–17, 2013, in Washington, D.C., to view exhibits on the Every Day Counts and Highways for LIFE initiatives to build highways better, faster and more safely. Make plans to attend the session on "Deploy! Case Studies of Successful Technology Deployment Methods From Across the Highway Transportation Spectrum" on January 16. Speakers include Judith Corley-Lay of the North Carolina Department of Transportation on new pavement design models, Byron Lord of the Center for Accelerating Innovation on lessons from the Highways for LIFE initiative and Jim McDonnell of the American McDonnell of the American Association of State Highway and Transportation Officials on the Technology Implementation Group and second Strategic Highway Research Program implementation efforts. Other speakers will be Kathleen Bergeron of the Center for Accelerating Innovation on using marketing principles to implement innovations, Jerry DiMaggio of TRB on SHRP2 implementation secrets to success and Crawford Jencks of TRB on the National Cooperative Highway Research Program. Check the meeting program for time and location. For more information on the TRB meeting, visit www.trb.org/AnnualMeeting2013/AnnualMeeting2013.aspx. Using design-build contracting helped the Missouri Department of Transportation save up to $89 million and more than five years of construction-related traffic congestion on its kcICON project on Interstate 29/35. 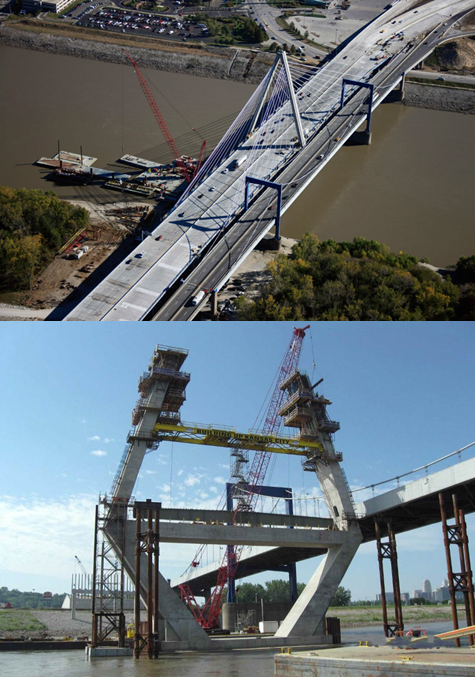 The project, which involved a 4-mile (6.4-kilometer) section of I-29/35 between Kansas City and North Kansas City, included construction of the landmark Christopher S. Bond Bridge across the Missouri River and reconstruction or widening of several other bridges. It was designed to increase capacity and improve safety on an urban corridor that serves 102,000 vehicles a day. A Highways for LIFE grant helped the Missouri DOT use designbuild contracting on a project that included the new Christopher S. Bond Bridge over the Missouri River. Inset: By using innovation, the Missouri DOT saved more than more than five years of construction-related traffic congestion on its kcICON project. A Highways for LIFE grant from the Federal Highway Administration helped the Missouri DOT demonstrate the use of innovation on the project. The key innovation was design-build contracting, which accelerates project delivery by combining the design and construction phases in a single contract and encouraging contractor flexibility. It was one of the agency’s first design-build projects. The Missouri DOT also used an innovative quality management program in which the project’s director had authority for many activities that in the past were ap- proved only by the agency’s chief engineer or the kcICON Commission. This allowed for more timely decisions and document approval, which shortened project time. "MoDOT gained considerable experience with the innovations used on this project and, because of its success, is encouraged to include these innovations on future projects," noted Missouri Demonstration Project: Design-Build Procurement Process for Construction on I-29/35 in Kansas City, an FHWA report. Conventional construction methods would have increased traffic congestion on the I-29/35 corridor north of the Kansas City business district for an estimated 10 to 15 years. Through the design-build process, the Missouri DOT reduced overall construction time to less than four years and opened the roadway to traffic six months ahead of schedule, surpassing the Highways for LIFE performance goal of halving construction time. An economic analysis of the project found that the Missouri DOT’s innovative approach saved between $62.1 million and $89.4 million over more traditional methods, a 27 to 39 percent savings on the $232 million project. A significant amount of the cost savings resulted from reduced construction time. Testing showed that the new Missouri River bridge is significantly smoother and slightly less noisy than the old bridge, an indication of the high quality of construction, although it does not meet the Highways for LIFE performance goals for smoothness and noise. The project did not include performance goals for work zone or worker safety, but data for the project area indicate that the crash rate increased only slightly during the construction years, the contractor’s number of lost-time incidents was less than half the industry standard for an equivalent project, and Missouri DOT staff had zero lost-time incidents. The use of base-grouted drilled shafts for the bridge foundations was a cost-effective solution that overcame a difficult geological condition and enhanced the reliability of each shaft. An inverted-T bent cap and a link slab for a joint-free bridge deck introduced immediate cost savings and reduced future maintenance expenses on a single-point urban interchange. Because of a price increase for structural steel and delayed delivery dates, the contractor used precast, prestressed concrete piles for bridge foundations instead of steel piles. The plans and specifications the contractor developed are expected to benefit the Missouri DOT on future projects. To read the Missouri report and other technical reports on Highways for LIFE demonstration projects, go towww.fhwa.dot.gov/hfl/projects. State highway agencies will use innovative 3-D technology, accelerated bridge construction techniques, precast concrete pavement systems, warm-mix asphalt and more to build the latest round of demonstration projects funded under the Highways for LIFE initiative. The Federal Highway Administration awarded nearly $9 million in grants for 11 new projects in California, Louisiana, Maine, Minnesota, New York, Puerto Rico, Utah, Virginia, Washington, West Virginia and Wyoming. Since 2006, Highways for LIFE has provided about $65 million in incentives for 70 demonstration projects in 35 states, the District of Columbia and Puerto Rico. Highways for LIFE demonstration project grants encourage states to try proven but underused technologies and practices in highway construction to improve safety and quality, speed construction and enhance user satisfaction. For each project, the highway agency sets customer-based performance goals and uses innovations to help meet those goals. The award to the California Department of Transportation will help the agency use virtual design construction technologies and methods on a project on U.S. 101 in Santa Clara. Virtual design construction uses 3-D topographic data to create multidimensional computer engineering models that can enhance a variety of processes—such as team collaboration, construction scheduling and public outreach—to cut construction time and costs and improve safety. The Louisiana Department of Transportation and Development plans to try innovative wide-area surveillance radar to manage work zone traffic when it reconstructs a section of U.S. 90 Business in New Orleans. Using the technology will keep drivers informed about real-time traffic conditions, increase safety and keep traffic moving during the project. Using precast deck panels will help the Maine Department of Transportation reduce construction-related congestion and enhance safety when it replaces Littlefields Bridge in Auburn. The panels, built off-site and transported to the work zone for rapid installation, will include corrosion-resistant composite reinforcing bars to prolong bridge life and reduce the need for maintenance. The Minnesota Department of Transportation will use a prefabricated superstructure and substructures to cut construction time in half when it replaces a bridge on Trunk Highway 61 over Nymphara Lane in Red Wing. Crews will slide the new superstructure into place during a road closure to reduce construction impact on the traveling public and improve safety. When the New York Department of Transportation rehabilitates the Interstate 90 bridge over Buffalo Avenue in Niagara Falls, it plans to incorporate precast northeast extreme tee beams, or NEXT beams. Using NEXT beams and accelerated bridge construction techniques on the project is expected to reduce the time road users are impacted by construction by 97 percent and significantly prolong the useful life of the bridge. The Puerto Rico Highway and Transportation Authority will use a modular arch precast concrete system when it replaces a bridge on PR-30 over PR-189 in Gurabo. The agency estimates that using precast elements on the project will reduce construction time and disruption to travelers by 55 percent. The grant awarded to the Utah Department of Transportation will help the agency reduce the construction schedule on a bridge project on U.S. 6 over D&RGW Railroad Spanish Fork near Provo. The agency will use ultra-high-performance concrete for deck panel joints and closure pours, which will eliminate the need for a post-tensioning process, improve safety and cut congestion. The Virginia Department of Transportation plans to use roller-compacted concrete to speed construction of the Staffordboro Park and Ride Access in Stafford County. Roller-compacted concrete allows paving projects to be opened to traffic faster and makes the paved surface durable under heavy loads without creating rutting problems. Enhanced safety is the aim of the Washington State Department of Transportation’s project to install state-of-the-art barrier delineators and light-emitting diode lane markers on I-90 over Snoqualmie Pass. The new delineators will be more durable and require less-frequent repair and replacement, while the lane markers will improve visibility at night and during inclement weather. The West Virginia Department of Transportation will use precast concrete pavement system technology to reconstruct a section of U.S. 60 near Charleston. The precast concrete pavement panels, cast off-site and installed quickly during off-peak traffic periods, will enhance safety for travelers and workers, reduce construction time and result in longer pavement life. The Wyoming Department of Transportation will evaluate two types of warm-mix asphalt technologies when it rehabilitates part of Highway 196 in Johnson County. Warm-mix asphalt allows for easier and better compaction of thin paving layers, resulting in better long-term pavement performance. Because warm-mix asphalt is produced at lower temperatures, it uses less energy and produces fewer fumes than hot-mix asphalt. For more information on Highways for LIFE demonstration projects, go to www.fhwa.dot.gov/hfl/projects. Here’s a sampling of how highway agencies around the country are using innovative technologies and processes to improve the way they build the nation’s highway infrastructure. A Highways for LIFE demonstration showcase drew more than 30 transportation professionals to observe the paving of a Safety EdgeSM on Mountain Ranch Road in Calaveras County, Calif. The participants also attended a workshop on the Safety Edge, a paving technique that helps prevent pavement edge drop-offs. A new California Department of Transportation policy requires the Safety Edge on all paving projects, except where the technique is not needed or cannot be used. The Indiana Department of Transportation conducted its first quality control/quality assurance soils project using intelligent compaction. The project involved the U.S.31/U.S. 35 interchange, part of the U.S. 31 Kokomo Bypass. The embankment contractor used rollers equipped with sensors that can determine the relative stiffness of the soil to map the embankment as it is constructed. The rollers also use GPS technology to determine the coverage of the rollers over the embankment area. The Hawaii Department of Transportation is featuring several Every Day Counts initiatives in its project to improve a section of Saddle Road, an east-west route across Hawaii Island. They include a geosynthetic reinforced soil integrated bridge system, the option to use warm-mix asphalt and a pavement Safety Edge. Alternate item bidding allowed contractors to choose between building a GRS-IBS or concrete box culvert bridge. When the bids were opened, the GRS-IBS option reflected an apparent savings of $2 million. New programmatic agreements in Connecticut and Ohio are designed to shorten the time it takes to deliver highway projects. An agreement signed in Connecticut will streamline the National Environmental Policy Act process by delegating to the Connecticut Department of Transportation the authority to classify two categories of projects as categorical exclusions without further FHWA approval. The Ohio agreement will shorten part of the environmental process and improve project delivery times by reducing the amount of review time FHWA needs and allowing for concurrent agency reviews. More than 50 transportation professionals attended a Harbor Beach, Mich., showcase to learn about a new bridge construction technique called Bridge in a Backpack. The Michigan Department of Transportation, Advanced Infrastructure Technologies and the Federal Highway Administration sponsored the event exhibiting the M-25 bridge replacement project. The $1.6 million project is Michigan’s first application of the technology, which can reduce construction time and result in a low-maintenance structure with an extended service life.